Defend your people. Seems like a simple enough premise, but when you're a winter warrior? Well, you've got a lot to worry about! Whether it's a warring faction in your homeland, mysterious creatures, or even an extended trip abroad, well, there's always seemingly some kind of threat to be prepared for. So, get ahead of the battle in at least one area. Make sure you have your battle outfit ready to go! We've got your back, of course, because we made this Women's Winter Warrior Costume right here at HalloweenCostumes.com. And it's positively ready for action! Styled after the ancient garb of your winter warrior ancestors, it will have you looking like a serious little lady. And that's something that's worth suiting up for! Of course, we don't condone or even suggest going into actual battle but when it comes to dressing up for costume fun? We heartily recommend that! This Made by Us costume is ready to make this Halloween a memorable one. 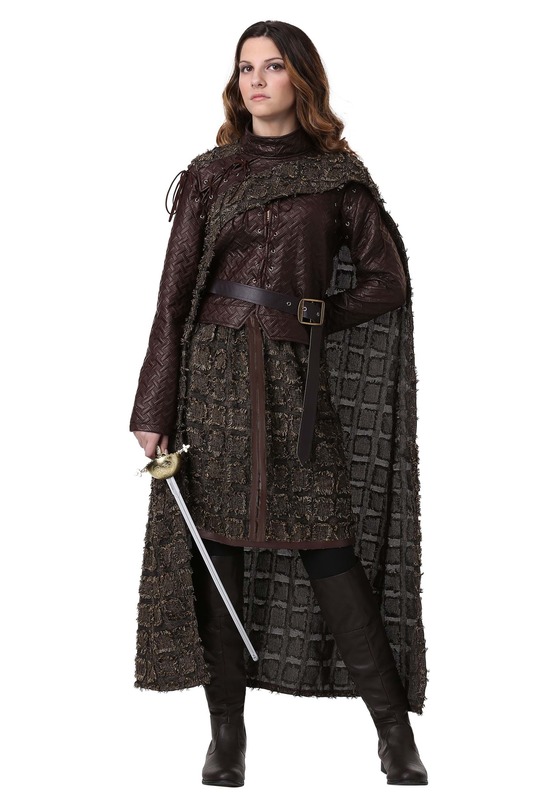 Styled as a jacket, skirt, cape, and belt, this Womens Winter Warrior Costume has all the gear you'll need. The faux leather jacket looks positively medieval with its pattern and stitching detail. The cape and skirt have a rough-hewn appearance, and will have you looking like you're ready for a trip to a colder climate! We endorse getting ready for winter. We also endorse dressing up as fantasy characters. At every opportunity! Model your costume experience off of your favorite story, or create your own new bold backstory. We're sure that when you suit up in one of our costumes, you're going to be a mighty character!